In fact, the entire notion is absurd. Anyone who has ever invested in the history of the world has lost money at one time or another. 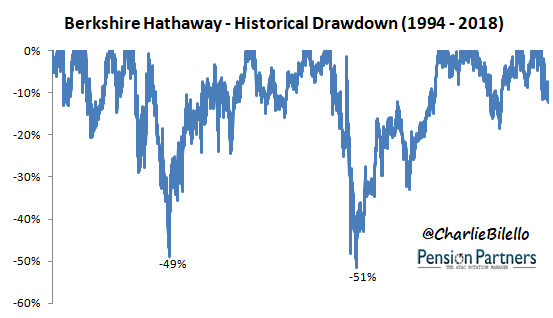 Buffett himself lost close to 50% on two separate occasions. 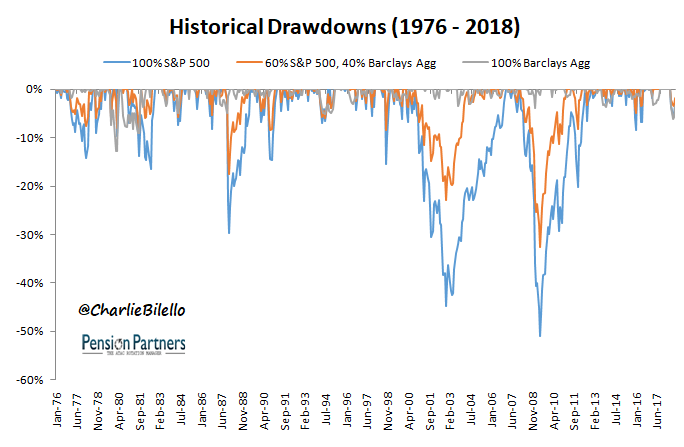 Being in a drawdown is the norm, not the exception. That is the price you pay in exchange for a higher return than a risk-free savings account. So what is the number 1 rule in investing? That’s an impossible question, but if I had to pick just one it would be the Peter Lynch line about “knowing what you own and why you own it.” For if you don’t get that one right, you won’t hold any investment long enough to reap the benefits of compounding. You can have the best assets/strategy in the world but if you don’t understand what it is you will abandon it at the first sign of trouble. And believe me when I tell you that there will be many times of trouble. Most advisors nowadays focus on asset allocation for their clients, typically a diversified mix of stocks and bonds. This is a good start, for asset allocation is the most important determinant of portfolio returns. While not the “market portfolio” (see my post on this here), many advisors consider a 60/40 split between U.S. stocks and bonds to be a sufficient baseline for the average investor. If an investor’s profile allows for more risk, this can be shifted to 70/30 (80/20, etc. ), and if an investor’s profile necessitates a more conservative stance, this can be shifted to 50/50 (40/60, etc.). Advantages of a stock/bond portfolio are that it is 1) low cost (less than .04% using ETFs), 2) simple in execution (as little as two index funds), and 3) easy for investors to understand, at least in theory. You have a growth component (stocks) and an interest/capital preservation component (bonds) to balance out that risk. These are the times that advisors earn their pay, for keeping investors invested is no easy ask. The best advisors don’t wait for such calls but are proactively educating their clients on what they own and why they own it. This is a never-ending job and often a thankless one. But it is the most important thing an advisor can do. My goal in this post is to dig deeper into stock/bond allocations, and hopefully give investors a better understanding of what they own and why they own it. Let’s begin. Investors are said to own stocks in an effort to earn a higher return. Makes sense, but what exactly does that mean? Higher then what? How much higher? And why are they giving you this higher return? Over long periods of time stocks have delivered a higher return than bonds (4.1% higher per/year), and you were able to earn this return because you were being compensated for higher volatility and higher drawdowns (from economic uncertainty and long-run growth risk). Since 1976 a 100% stock portfolio (far left side of table below) has had the highest return (11.5%) with the highest volatility (14.7%) and max drawdown (-51%) while a 100% bond portfolio (far right side of table below) has had the lowest return (7.3%) with nearly the lowest volatility (5.3%) and drawdown (-13%). 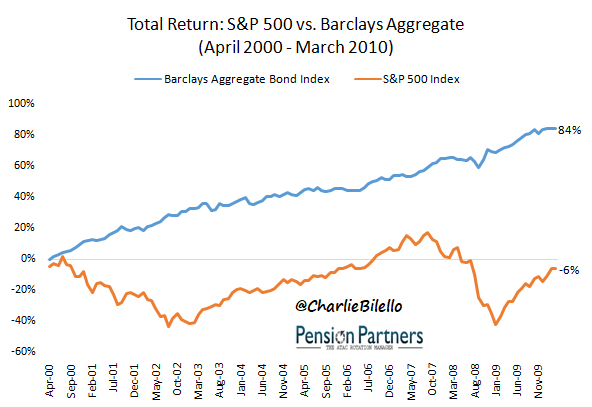 Note: throughout this post when I refer to stocks I am using the S&P 500 Total Return Index and when I refer to bonds I am using the Bloomberg Barclays US Aggregate Bond Total Return Index. The data period is from January 1976 through May 2018. I started in January 1976 as that is the start of the Barclays Index. Data Source: Bloomberg/YCharts. Showing that stocks have earned a higher return with higher volatility over long periods of time is the easy part. The hard part is explaining to investors that they are by no means guaranteed this higher return, particularly over shorter periods of time. And by shorter periods of time, I mean even as long as 10 years. 10 years, you say, that’s an eternity. Indeed, but from April 2000 through March 2010 stocks declined 6% while bonds gained 84%. And they did so with 16% volatility versus 4% for bonds. The lesson here is clear: the so-called “risk premium” from stocks is far from constant, and there can be long periods of time where it is negative (stocks lose money with higher volatility than bonds). Understanding that – and I mean really understanding that – is critical in setting realistic expectations. If an investor is not equipped to handle a large drawdown (mentally, emotionally, or financially), they cannot put all of their money in stocks. Which brings us to the next topic. If stocks never went down there would be little need to own anything else. But as we know, they do go down from time to time. Since 1976, there have been seven calendar years in which stocks have finished lower: 1977, 1981, 1990, 2000, 2001, 2002, and 2008. In each of these years, bonds have finished higher, cushioning the blow. With a 20/80 split between stocks and bonds an investor would have been down only once: 2008 (-5%). A 10/90 split never had a losing year. Why do high quality bonds provide such a cushion? Because they are not driven by the same fundamental factors as equities. Bonds are driven by interest rates (both absolute levels and changes) as opposed to earnings growth and multiples. As such, the overall correlation between bonds and stocks is low at .21. During down months for stocks – and this is key – that correlation drops to 0.00. This effectively means that there is no reason to expect a down month in stocks will spillover into bonds. The performance data supports this. Since 1976, during down months for stocks, bonds have been up 60% of the time. The higher the percentage of bonds, the higher the odds of having a positive return when the stock market is down. You’ll also note in the table above something of great importance – that exposure to bonds does not mean one should expect a negative return when stocks are up. In fact, a portfolio that is 70% bonds and 30% stocks is up 90% of the time when stocks are up. There are two reasons for this: 1) bonds are slightly positively correlated (0.23) to stocks in up periods for stocks (up 73% of the time), and 2) equity exposure is by far the dominant exposure. To illustrate this second point, let’s have a look at a table of correlations. A portfolio that is evenly split between stocks and bonds has a .95 correlation to stocks and only a .50 correlation to bonds. It is going to behave much more like the stock market than the bond market. This is a surprise to many but it should be intuitive as stocks (on average) have 2.8 times the volatility of bonds. Stock volatility overwhelms the movement of bonds. Which is why if you want/need your portfolio to move more directionally with bonds than stocks, you need to have something closer to a 20/80 split. Knowing what you own and why you own it may be the most important rule, but it is just the beginning of the investing process, not the end. Once you understand what and why you own something the hard work begins. You must have faith that your chosen asset allocation plan will work over time and have the fortitude to stick with that plan through the many periods in which it is “not working” (aka in a drawdown). This is no small task as us humans are emotional beings and we have little tolerance for things that aren’t always working. But that is the challenge for which there is great reward at the end; the alternative (a risk-free savings account) always works but will leave you with far less in the long run. So take a good look at your portfolio today and make sure you know what you own and why you own it. Then ask yourself if you have the faith and fortitude to stick with it over time. And finally, remember that every investor loses money, even the great Warren Buffett. That’s the price of admission.